We have a firm vision of what the future will bring — because we are the health care professionals leading the way. Every day our researchers and clinicians are exploring breakthroughs in medicine. From our Center for Cell and Gene Therapy, where we are making vast strides in understanding the role of genetics in disease initiation and prevention to redefining the role of nursing in neuroscience, cardiovascular and oncologic protocols, the Houston Methodist team is constantly ushering in new ideas and innovations in caring. Houston Methodist’s translational research program is dedicated to translating medical research conducted at a laboratory bench directly to the patient’s bedside. 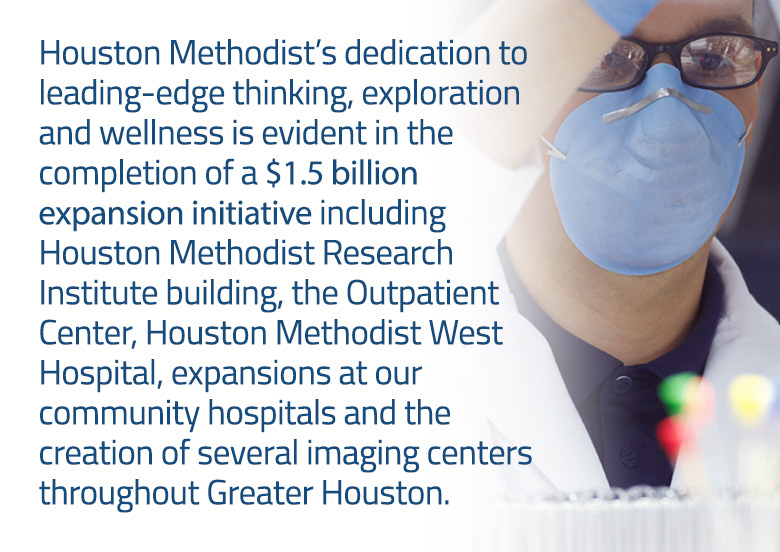 Houston Methodist is in a unique position to deliver successful outcomes in translational research, now having a research facility so closely connected to the clinical operations at Houston Methodist (literally and figuratively) and giving our physician-scientists access to a well-established, large, diverse patient base. Our position is strengthened further by partnerships with neighbors in the Texas Medical Center and beyond.